Beaphar Vit-Bits are delicious little treats made up from a crispy outer coating surrounding a delicious vitamin paste. Together the combination makes an irresistible little treat that is good for your cat. Grain, vegetable by-products, milk & dairy products, oils & fats, meat & meat by-products, yeast. Vitamin B1 (60 mg/kg), vitamin B2 (15 mg/kg), vitamin B3 (150 mg/kg), vitamin B5 (6 mg/kg), biotin (75 mg/kg), taurine (630 mg/kg), antioxidants, colourants. Feed your cat 5 - 10 treats per day. 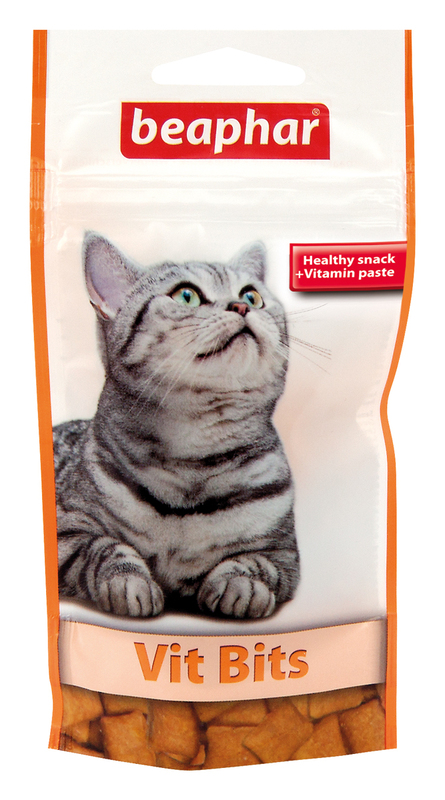 There are currently no questions for Beaphar Vit-Bits Cat Treats - be the first to ask one!